Troop 464 parents/scouts who wish access to the private site (calendar and pictures) can contact either Karen or Mark B. to obtain a password. in the Boy Scout Cabin located at 515 Lincoln st. Meetings are most Monday nights, excluding those immediately after an outing. Outings occur monthly,most are overnight hiking / camping trips. We attend a week-long summer camp in July. Boys Scouts is for boys age 11-17. Boy Scouts gives you an opportunity to try new things, explore the outdoors, meet new friends, and have fun at the same time. Why is it fun? Because you and your scout friends run the troop. You’ll be teamed up with some older scouts who will "show you the ropes". In a few years, you’ll be the older scout, and you’ll help lead the troop! Parent Involvement — We want scout parents to be as involved with the troop as they feel comfortable. The most important thing is for you to be there to support your scout. Parent Meetings — As a parent, we encourage you to participate in our monthly committee meetings. This is where the adults plug in to support the troop with logistics, learn about upcoming events, and provide feedback to the troop leaders. Adult Leaders — Your sons deserve the guidance of trained adult leaders. All of our adult leaders are required to take the district training for their position, and many of our leaders have completed advanced adult training. Cost — At this time, we have no annual dues. 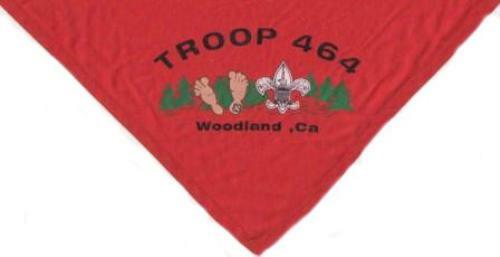 New scouts receive a troop t-shirt and neckerchief. Your scout will need a full uniform (shirt and shorts or pants), Scout Handbook, and personal items for camping such as a sleeping bag and mess-kit. The troop provides the major camping equipment including tents. Major trips such as summer camps require separate fees, many of which can be covered by our fundraising programs.